Quick: Picture a hipster coffee shop. If reclaimed wood and Edison bulbs came to mind, there are two Dallas architects that would like to treat your eyes to something completely different. Although the Sylvan Avenue location is Houndstooth’s fourth, it doesn’t have a chain-like visual identity so Mark and partner Amy Wynne Leveno were given freedom to design down to the very last detail. Better yet, Houndstooth owner Sean Henry asked the firm to extend its ideas to Jettison, a sister cocktail bar in the same building. The interiors offered substantial volume, allowing OFFICIAL to calibrate the sense of scale in the day-and-night spaces. “We looked at the whole space in section first to create a cafe and bar that were different, but related,” Amy said. 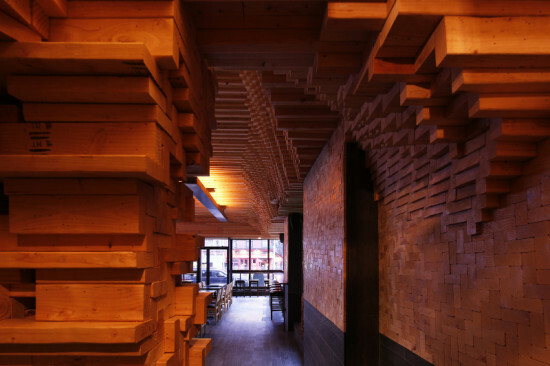 That thinking is most evident up top: To balance the 16-foot-plus ceilings with a cafe coziness, the architects designed a “cloud” over the Houndstooth coffee bar to conceal the mechanical equipment. In Jettison, the mirror is a recessed “celestial void” lighting scheme made of painted gold trusses—and acts as a plenum space for the air conditioner. Concentrating mechanical functions in this way allowed the architects to keep the trusses in both spaces clean; the bright white Houndstooth ceiling foils Jettison’s sleek velvet finishes. The cafe’s focal point, a circular service counter, would look right at home in a real bar—and that’s on purpose. Houndstooth is serious about coffee; baristas are as well versed in their brews and beans as they are in the perfect pour. Laptop-toting young people and families have a choice of seating: There’s a patio, communal tables, and stadium seating in the form of double-tiered oak benches that kids like to climb on. Being Dallas, there’s opportunity for outdoor drinking. The patio was a “weird throwaway space” that came with the building, but the architects adopted it into their vision with a bold houndstooth-patterned screen that casts great shadows as it separates patrons from a busy road. “It’s fun seeing this location on social media,” he added. 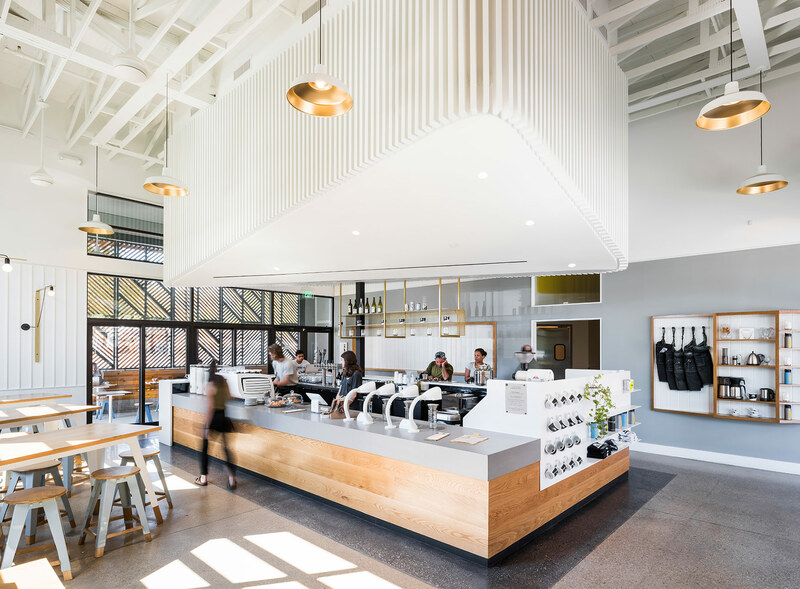 “Typically people take pictures of their coffee, but they’re also taking pictures of the space, engaging with the architecture.” Both bar and coffee shop opened in July 2016, and so far the internet agrees: “Would have to say this is the best-designed coffee shop in Dallas,” said Google user Jeremy Turner. And not an Edison bulb in sight. 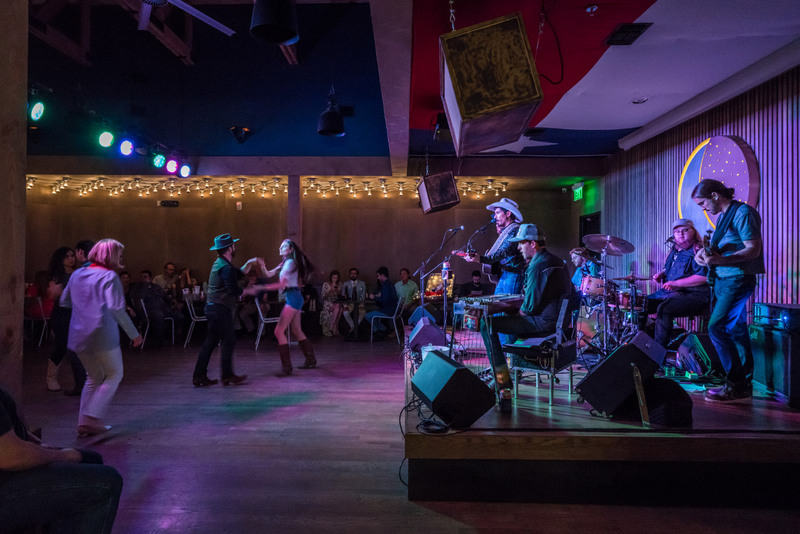 Like a flawless shoe that tones down—or turns up—a look, Dallas-based OFFICIAL has transformed a 2,100-square-foot space into a day-to-evening cafe-bar whose design cements the brand of a well-loved Texas coffee shop. While Houndstooth Coffee’s fourth location is a sun-flooded, airy space, its sibling cocktail bar, Jettison, occupies a velvety nook in the same building. 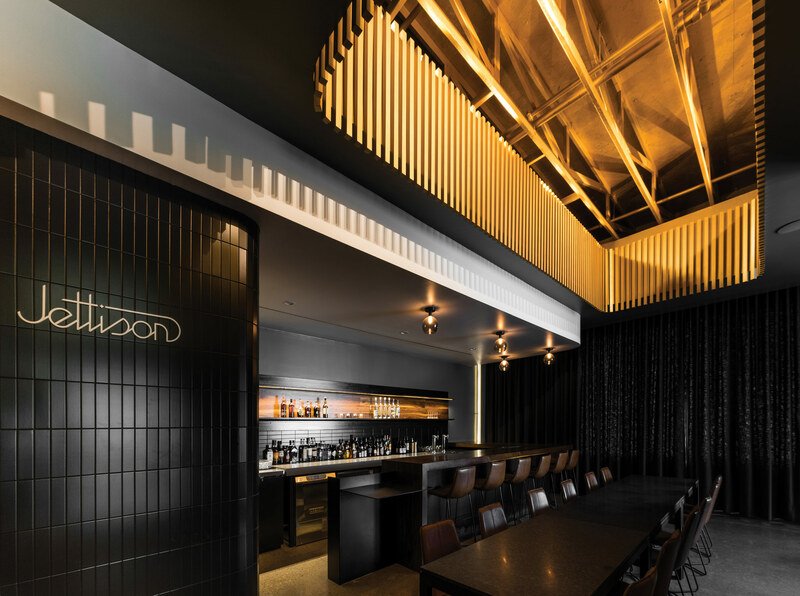 The bar’s lower ceilings are punctuated by a celestial gold-painted and trussed cavity that releases just the right amount of mood lighting into the space while providing clever coverage for the HVAC system. Custom fabrication shapes the space top-to-bottom: The perf wall light next to the bar was designed and fabricated locally by Mark and Amy Wynne Leveno, OFFICIAL’s cofounding principals. 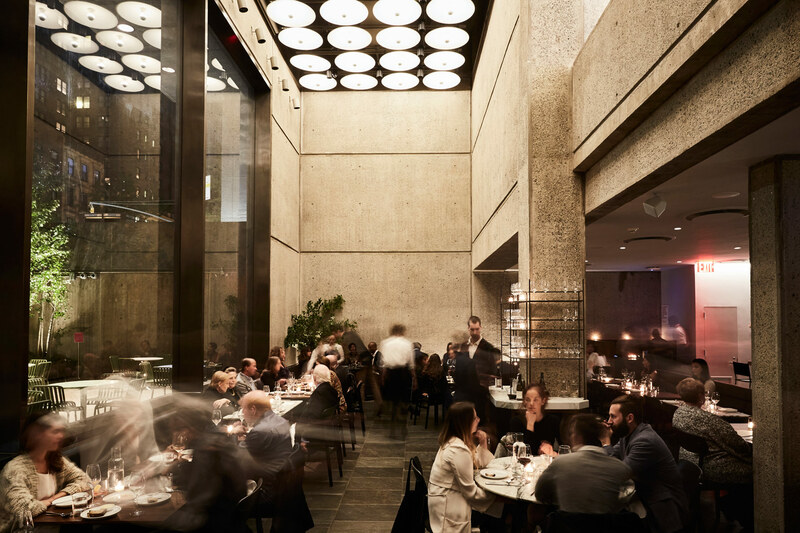 To complement the geometry of the fixtures and ceiling element, a textured dark-gray curtain along the exterior wall softens the space and brings the focus to conversations around the bar and central communal table. All summer the Los Bar—built by MAK Center residents Andreas Bauer, Christoph Meier, Robert Schwarz, and Lukas Stopczynski—gave those without airline travel points a taste of Vienna. Constructed in a garage of R.M. Schindler’s Mackey Apartments, the saloon mimics Adolf Loos’ American Bar, swapping out onyx and marble for painted MDF and cardboard. Police shut down the blind pig due to neighbor complaints, but we’re hoping all is not lost for Los/Loos. AN may volunteer the LA HQ for a Loos weekend. These days, the illicit thrill of sneaking into a hidden bar from the back of a video store is a mere blip on our adrenaline threshold. But a new speakeasy in Shanghai aims to reinvent the game with a sleek underground bar concealed behind the innocent facade of a sandwich shop. The diner setup is intact, but the glossy countertops in bright shades, neon lighting strips and polished minimalist furniture against unfinished walls emit a suspicious whiff of not-diner. Slot some coins into the vintage-looking Coca Cola vending machine in the corner and it suddenly swings outward, revealing a cooly-lit tunnel and the not-too-distant din of sophisticated chatter. A contrastingly different setting reveals itself: a chic, dimly-lit bar clad in dark tones of black and brown. By the entrance, floor-to-ceiling shelving holds bell jar-shaped whiskey bottles, a spotlight beneath each one illuminating the amber liquid within. A canopy of copper-inlaid lighting overhead echoes this warm glow, while white LED lights on a slanted plane behind the bar visibly project the liquor bottles outward. The owners of 'Flask and The Press' commissioned designer Alberto Caiola to create a mysterious, dynamic setting without feeling too try-hard. 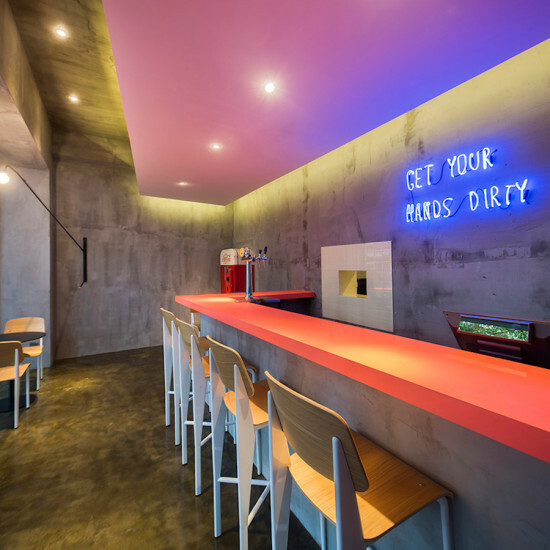 “Considering that Shanghai has already seen its fair share of hidden speakeasy-themed bars and lounges, we decided to build suspense and break it in an entirely unexpected fashion,” Caiola told Designboom. Suspended from a wall adjacent to the entrance is an installation of flasks covered by a veil so that only their outlines are visible. Rather than partitioning the seating areas, Caiola juxtaposed chesterfield sofas, bar stools and winged armchairs of different heights to visibly section the space. The wooden floorboards underfoot alternate from dark to light to dark again in keeping with this variation, while cascading cubes suspended from above relieve the low-ceilinged space of stuffiness. A wunderkind at visibly expanding a confined space, Caiola plays tastefully with convex mirrors and slanted planes to lengthen and focalize.